National Equal Pay Day, held on Tuesday April 14th, 2015, recognizes the wage gap that exists between men and women in American society. Organized by the National Committee on Equal Pay (NCEP), a coalition of organizations committed to pay equity, and annually held since 2005, this day is observed across the United States through public lectures, meetings, rallies, and protests. Generally falling on a Tuesday in early April, the timing references how far into the current year women must work to match what men earned in the previous year. Tuesday signifies how far into the week women work to earn what men made the previous week. NCEP advocates the wearing of red on Equal Pay Day to symbolize how far women and minorities are ‘in the red’ with their pay.” This day is not solely an American endeavor – it is held internationally, in countries such as Germany, Switzerland, Belgium, and the United Kingdom. Why do we have Equal Pay Day? Equal Pay proponents point to a long history of employment discrimination in the United States. According to the Women’s Bureau of the U.S. Department of Labor, in 2012, the median weekly earnings of women working full time were only 81% of men working full-time. Up from 64.2% in 1980, there is improvement but still much to be gained. Minority women are at an even greater disadvantage for full-time wage and salary work. As of 2012, African American women earn 68% of what White men earn while Hispanic women receive on average 59%. 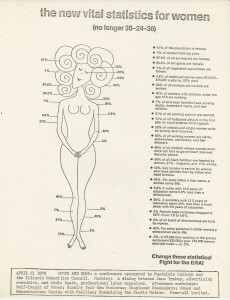 This ad created by Jane Trahey for a Mundelein College Event illustrates the income inequality in 1979. What is the History behind Equal Pay? The issue of equal pay for women has a long and complex history. Fought on many fronts, the quest for equal pay in America picked up steam following World War II and is punctuated by passage of the Equal Pay Act in 1963, the Civil Rights Act of 1964 (specifically Title VII) and 2009’s Lilly Ledbetter Fair Pay Act. Other legislation has been introduced over the years to provide additional safeguards. The latest such effort, the Paycheck Fairness Act, introduced by former senator Hilary Clinton and Congresswoman Rosa DeLauro, was ultimately rejected in 2012. What Collections at the Women and Leadership Archives relate to Equal Pay Day? At the Women and Leadership Archives, collections of organizations that relate to equal pay rights for women include 8th Day Center for Justice; United Nations Development Fund for Women; Chicago Catholic Women; and the Homemakers Equal Rights Association. We also have many collections that document individual’s efforts for pay equality. These include women such as Mollie Leiber West, Helen Sauer Brown, Peggy Roach, Carol Ronen, and Bari-Ellen Roberts. This is just a selection of the collections held in the Women and Leadership Archives that concentrate on peace and social justice activism, of which equal pay is a part. “Equal Pay Day,” Accessed March 3, 2014. http://www.pay-equity.org/day.html. This entry was posted in Uncategorized and tagged Archives, Equal Pay Day, History by Women and Leadership Archives. Bookmark the permalink.